The City of Toronto will implement an aerial spray program this spring in seven Toronto wards to protect the tree canopy and vulnerable trees from European Gypsy Moth infestation. The City is hosting public information sessions from April 16 to May 14 for residents to learn more about the City’s efforts to reduce gypsy moth caterpillar population in Toronto. Gypsy moths are an invasive insect whose caterpillars feed on the leaves of oak and other deciduous trees. The severe leaf loss created by these insects can make trees weak and susceptible to diseases and weather fluctuations. Untreated, this can result in the loss of public and private trees. 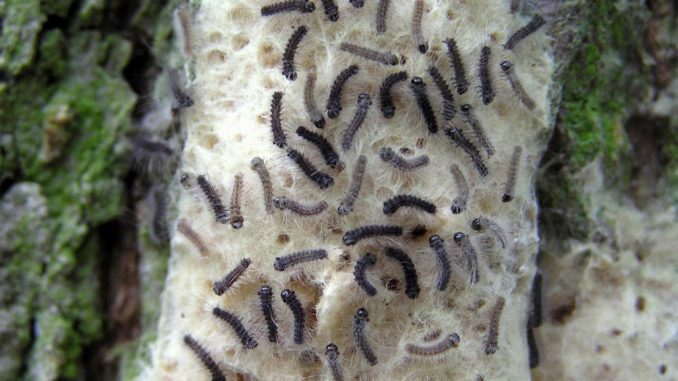 During the last few years, the City has controlled gypsy moth caterpillar populations using integrated pest management measures including tree banding and injections as well as egg scraping. However, a number of high-risk areas in Toronto have been identified where these methods alone will not effectively control or reduce the population. Wards 1, 2, 3, 4, 11, 12 and 15 have been identified high-risk as they contain a large portion of the City’s oak trees and exhibit significant gypsy moth egg masses. • Wednesday, April 17 from 6 to 8 p.m., Mount Pleasant Cemetery, 375 Mount Pleasant Rd. • Wednesday, April 24 from 6:30 to 8 p.m., Swansea Community Recreation Centre, 15 Waller Ave.
• Tuesday, April 30 from 6 to 8 p.m., Rosedale United Church, 159 Roxborough Dr.
• Wednesday, May 8 from 6 to 8 p.m., Bob Abate Community Centre, 485 Montrose Ave.
• Tuesday, May 14 from 6 to 8 p.m., Memorial Health and Fitness Club, 44 Montgomery Rd. The City will implement a four-day aerial spray program from May 15 to June 16, between 5:30 and 7:30 a.m. Leaf size, caterpillar size and weather conditions will determine the exact spray dates. The City will post the spray dates and other application information 48 hours in advance at http://www.toronto.ca/gypsymoth. During the aerial spray program, two twin engine helicopters with ultra-low volume spray systems will apply Foray 48B Biological Insecticide Aqueous Suspension of which Bacillus thuringiensis subspecies kurstaki is the active ingredient – Pest Control Products Act Registration Number: 24977 class 11. This is a biological control made from a naturally occurring bacterium found on dead or decaying matter in the soil that poses minimal risk to human health and is approved by Health Canada for urban aerial use. The City of Toronto used Foray 48-B during its 2017 aerial spray program. The pesticide will be applied to tree foliage and must be digested by the caterpillars to be effective. The pesticide does not affect adult moths, butterflies, bees, fish, birds or mammals. More information about the upcoming aerial spray program, including an opportunity to subscribe to email updates, is available at http://www.toronto.ca/gypsymoth or by calling 311.